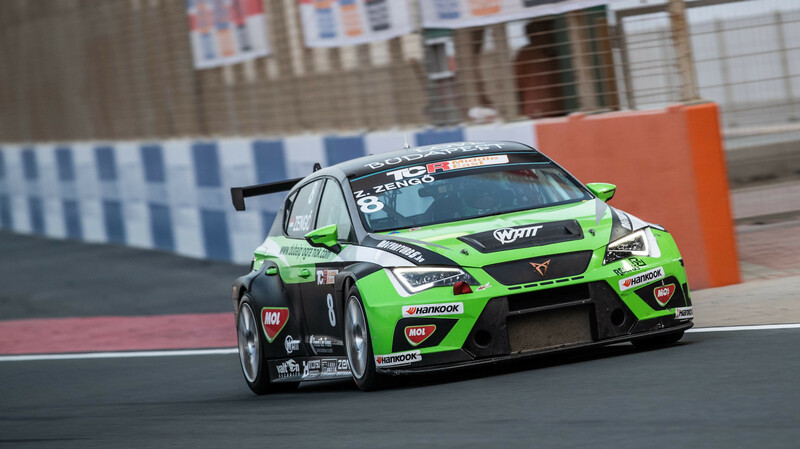 World Touring Car Cup team principals René Münnich and Zoltan Zengõ won between them the first three races of the opening round of the 2019 TCR Middle East series, which fielded a disastrous grid of just three cars at the Dubai Autodrome. In the third year of the series, and the first year under its new commercial owner Creventic, the promoter of the highly successful 24HSERIES events, a paltry three cars were fielded for the first two TCR Middle East series sprint races on Friday. This was followed by a six-hour endurance race on Saturday as part of the Middle East Championship, where the three TCR class cars were joined by a prototype sports car, which was significantly faster. Münnich, who has touring car experience in the World Touring Car Championship, European Touring Car Cup and TCR International Series, and more recently has been a World Rallycross Championship regular, comfortably secured pole position for the first race in his Honda Civic Type R FK8 TCR. The German went on to win by 37 seconds over Dutch driver Luc Breukers, who was racing in a Red Camel Racing-run Cupra TCR, while Zoltan Zengõ, the team principal of the famous WTCC and now WTCR independent team, finished third, 54 seconds behind after 17 laps. Zengõ started from pole for the fully reversed Race 2 grid in his Cupra TCR, but the running order from Race 1 was soon restored, with Münnich going onto win again, this time nearly 43 seconds clear of Breukers, with Zengõ third, over a minute behind. For the six-hour race on Sunday, Yusif Bassil paired up with Breukers in the Cupra TCR, while Breukers himself took on double duty, pairing up with Münnich in the Honda, while Zengõ was joined by Csaba Toth, who had raced for his team in the final year of the European Touring Car Cup in 2017. The endurance race took its toll on the field, with both the Münnich Motorsport Honda and the Red Camel Racing Cupra retiring, leaving Zengõ and Toth to take an undisputed victory, the only finisher in the TCR class in a race which only two cars finished in total, with the prototype class car six laps ahead of the Zengõ Cupra. René Münnich now leads the 2019 TCR Middle East series points standings by 15 points over Breukers, a series which was won by British driver Josh Files in 2017 and Germany’s Luca Engstler in 2018. The second round of the series takes place next weekend at the Yas Marina circuit in Abu Dhabi, with the season finale back at the Dubai Autodrome a week later.